OK, you’ve done most of your homework researching high performance blenders, and like most consumers you now understand that it’s all come down to a straight battle of Blendtec vs Vitamix , two of the best kitchen appliances ever created. Both units are equally as popular and can handle jobs such as making nut butters, doughs, soups, sauces, ice creams, milkshakes and many more. So this comparison is here to help you decide which unit is better suited to your needs. Personally over the years I’ve changed my mind on the Blendtec vs Vitamix issue many times. My opinion has changed due to blender evolution and the fluctuating price points. As each brand improves its blender design and pushes the boundaries a little further, or if the price point favors one over the other, I tend to switch… it’s that close. As we see below, the machines do have some very subtle differences, but I am confident enough to say that which ever blender you choose, the Blendtec vs Vitamix, you will not be disappointed! At 22 inches high the Vitamix can be a little on the high side. Whereas at 15 1/2 inches the Blendtec is shorter and will fit under most cabinets. Weighing in at almost 11 pounds the Vitamix is considerably heavier than the Blendtec which is just over 7 lb. On the other hand, the size and weight of the Vitamix compared to Blendtec makes it feel stronger and seems a little more robust. When comparing between the Blendtec vs Vitamix, the major difference lies in the technology used in the controls as the Blendtec offers a more advanced system. 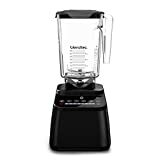 Blendtec blenders are geared more towards people who like cutting edge technology everywhere in their home, while Vitamix features simpler controls and is geared more towards the technologically challenged. My own opinion is that the digital controls are a big plus point, as you can simply push a button and walk away, the programming on the Blentec means that it knows when it should shut off to result in the perfect recipe. But from the Vitamix view point, some would say that there’s less that can break or go wrong with manual controls. Having said that, we must understand that a lot more goes into breaking down whole fruits and veggies than just horsepower and rpm. The design of a blender’s carafe, its blade system and torque are all probably more important factors. And to be honest, if you look at the Vitamix compared to Blendtec you will find that both of these blenders are powerful enough at more than double the power of a basic home blender. Both the Blendtec and Vitamix now come with 64 oz BPA free carafes. 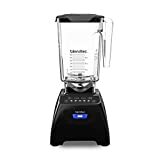 Optionally you can pay a little more on the Blendtec to get the Wildside blender which has a 96oz jar and a 4oz blade… If you blend in large quantities it makes sense to go for this larger jar at just around $50 more… it’s probably a little quicker to. Reports are in that the Vitamix carafe can last up to twice as long as the Blendtec, but I wonder if that’s because it’s only used half the time? The Vitamix requires a second ‘dry container’ to grind grains, but with the Blendtec you can blend wet and dry ingredients all in the same container. The Vitamix regular jar will be OK for occasional grain grinding and lighter dry loads such as oats, or grinding sugar in to powder. But you will have to purchase a separate jar at around $100 to grind the harder whole grains like corn, rice and wheat. Having said that, I have noticed that the dedicated jar on the Vitamix does a marginally better job in this department. It is specifically designed to grind grains and produces ever so slightly finer powder, but nothing of real note. I guess that if the Blendtec jar tends to last half as long as the Vitamix, in the long run you may actually end up purchasing 2 jars which evens out the price difference between the machines. With the Blendtec there’s no need to use a tamper, so again the technology makes life easier for us with this appliance. Having said that, some people love the fact that the tamper gives them more control. For example when making nut butters, you have to frequently stop the Blendtec and stir the nuts so that they all get blended. With this task on the Vitamix using its tamper is much quicker. But, I do want to be clear on this point; for the majority of recipes the Blendtec will not need to be stopped. Blendtec is more powerful, but with that comes more noise. The Vitamix has built in noise reduction technology in the jar and has a rubber insulating pad on its coupling. Once again the difference is minimal. Blendtec vs Vitamix is always going to be a close run battle, especially as they now both offer the same fantastic 7 year warranty. But but right now the Blendtec price is a bit lower. If you add in the many function buttons and the ability to grind flour in the ‘standard’ jar, with no extras or attachments needed, the Blendtec just edges it for me (for now). But then I would choose automated technology over manual leavers and buttons most of the time, it’s a personal preference of mine. The Blendtecs smaller footprint also has sway with me right now, as I’m limited for counter space in my kitchen. But above all remember this is just my opinion, I really don’t think you can make a bad choice with either Blendtec or Vitamix. 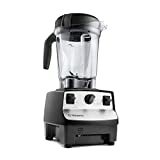 And if you are concerned about the price, just remember to factor in that these units are well built and will last a long time, I’ve heard from visitors to this site that have had one of these blenders more than 20 years. Even if you disregard the nutritional benefits of a high performance blender, remember that you could be burning through several average home blenders before you would have to replace one of these. 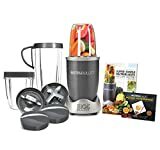 If you would like more detailed information on each appliance, we have the full Blentec blender review and a full Vitamix blender review. And don’t forget to check out Blendtecs Wildside blender, which has a new bigger five sided container and a 4inch blade.